In a Miami Herald article earlier this year, Edgewater’s location was said to be at “the intersection of funky and trendy.” And by all accounts, that is exactly where it is located. Bordered by NE 17th Street (north); Tuttle Causeway at 36th Street (south); Biscayne Bay (east); and, the railroad or Biscayne Boulevard (west), Edgewater is bursting with real estate projects from some of the most successful developers in the country and, even the world. This once devastated neighborhood is coming to life with excitement as the economy rebounds. Edgewater has two big draws that makes it a target for revitalization: its close proximity to the fashionable Design District and Midtown neighborhoods, and its prime location fronting Biscayne Bay. With the explosion of high rise projects under construction or in the works to begin construction, there are a few Miami condominiums worth mentioning as they bring so much to the community in terms of amenities and lifestyle as well as their appearance along the Miami skyline. 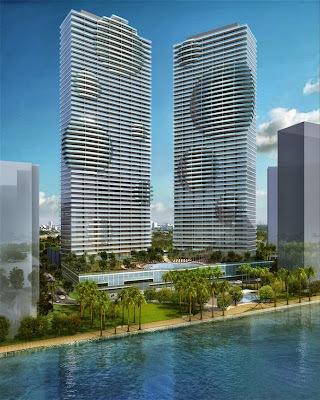 Developed by the iconic Related Group, Icon Bay is situated facing Biscayne Bay. With construction underway and already to the fourth floor, this building is sure to be an Edgewater landmark. When complete, the 40-story condominium will feature unbelievable panoramic views from every residence and luxury details. With only 8 units on each floor ranging in size from 900 to over 2,000 square feet (penthouses), a water park and all the community amenities that are expected in a high-rise condominium of this caliber, it is no wonder it has been so well received. Its popularity is very apparent in the simple fact that the building is virtually sold out. Another brain child of Jorge Perez and the Related Group is glamorous Paraiso Bay. Spanish for ‘paradise,’ this pre-construction condominium is tentatively scheduled to begin construction in the next few months. It will be set on five acres that will include a beautiful new park. The plans call for two- 55-story towers each housing approximately (345) one, two, three and four-bedroom units ranging in size from about 1,000 square feet to about 2,500 square feet. Each residence will showcase glorious bay views. Each floor will contain a maximum of seven units that look to be lined across the building. One amazing accomplishment of Jorge Perez is that with the five-acre plot of land on which Paraiso Bay will be developed, he has successfully and permanently closed off 31 Street at the Bay in return for adding a park with playground equipment, lots of green space and more. List prices for Paraiso Bay fall between the mid-$500s and over $1.1 million for units that range in size from just over 1,000 square feet to well over 2,100 square feet. For more details, check out a recent blog entry and stay tuned for information as it becomes available. 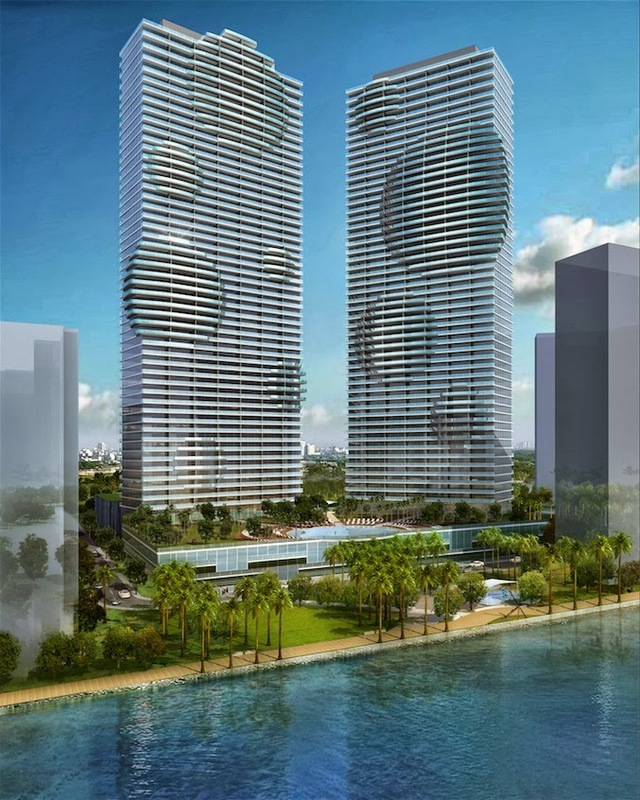 Biscayne Beach is another pre-construction project in Edgewater tentatively set to begin construction in early 2014. 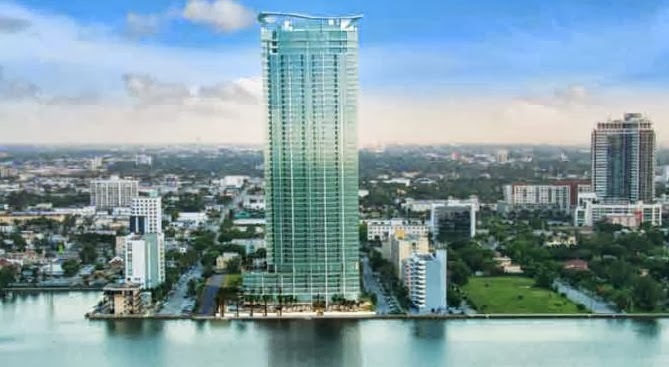 The plans call for a 51-story bay front high-rise condominium with 399 units. This masterpiece is under development by Eastview Development and GTIS Partners and will showcase Miami’s first manmade beach club directly on Biscayne Bay. Biscayne Beach residences will offer one, two, three and four-bedroom options in addition to penthouses with private rooftop garden terraces. Every unit will also have floor-to-ceiling windows, large balconies and beautiful Biscayne Bay, Miami Beach and city views. List prices range from the mid-$400s to well over $1 million for units with sizes between almost 900 square feet and over 2,100 square feet (penthouse prices available upon request). With Miami condominium construction in such a growth mode, Edgewater is definitely a growing neighborhood. In the aforementioned Miami Herald article, Carlos Rosso, President of Condo Development at Related Group said that “Edgewater’s layout works well for high-rise condos” as it sits in a prime area of Miami with Biscayne Boulevard running parallel to the Bay is the major thoroughfare of Biscayne Boulevard with shops and restaurants. He said “it’s an attractive area. It’s got good bones.” That refers to its structure and placement with the Design District, Midtown and the Wynwood Arts District surrounding it. With more and more developers gobbling up parcels of land, it will be fun to watch Edgewater become one of the most sought after neighborhoods in Miami – it is not already there.